Next-level convenience right here, courtesy of Keurig and GE. Big high five to GE’s new product development team. 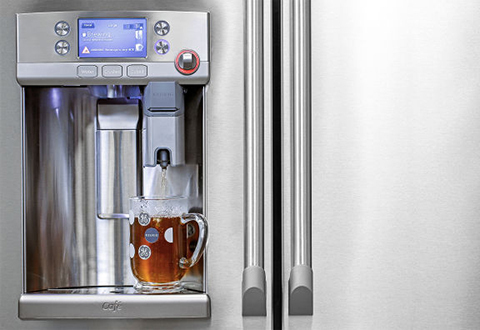 GE just created a fridge with a Keurig K-Cup brewing system built into the refrigerator’s water dispenser. It will be available fall 2015 for $3,300, right in time to gift yourself one for the holidays. Sure, the taste of Keurig coffee pods is a bit lackluster, and the ecological impact of all those disposable plastic tubs is a bit frightening—but when you need coffee, you need coffee. And the water the fridge uses is purified before it’s dispensed, which will presumably help improve the taste of your coffee and tea. 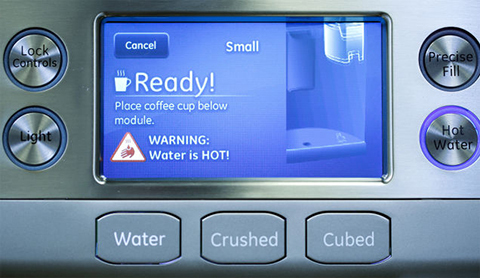 Once the Keurig has been set in place with a pod inside, the fridge’s user-interface on its built-in LCD display will ask you: small, medium, or large? Then, all you have to do is use a dial to start the hot water flowing as an added safety precaution. Coolest feature: The fridge can be remotely controlled from an app, which will let users schedule times for when the water is pre-heated so it’s immediately ready to dispense when you roll out of bed and think: Omfg I’m going to die if I don’t have a cup of coffee in my hand in the next 10 seconds. And for all you sad New Yorkers with minuscule kitchens, just think: Having a Keurig machine built right in to your refrigerator will free up some valuable counter space.